Nvidia has unveiled the final version of CUDA 5, The platform is available as free download from its developer website. 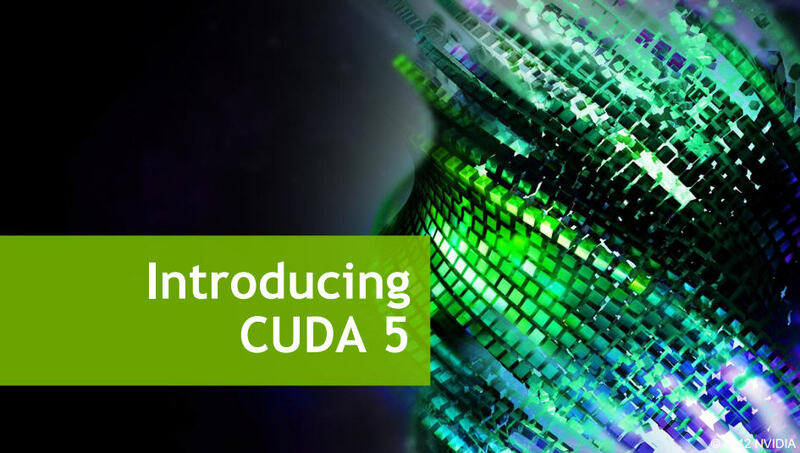 According to Nvidia, CUDA 5 adds dynamic parallelism, which allows the GPU to create new threads, as well as GPU-callable libraries and GPUDirect Support for RDMA to enable direct communication between GPUs and other PCI-E devices. Also new is the Nsight Eclipse Edition which can be employed to develop, debug and profile GPU applications within the Eclipse-based integrated development environment on Linux and Mac OS X.
GPU threads can dynamically spawn new threads, allowing the GPU to adapt to the data. By minimizing the back and forth with the CPU, dynamic parallelism greatly simplifies parallel programming. And it enables GPU acceleration of a broader set of popular algorithms, such as those used in adaptive mesh refinement and computational fluid dynamics applications. A new CUDA BLAS library allows developers to use dynamic parallelism for their own GPU-callable libraries. They can design plug-in APIs that allow other developers to extend the functionality of their kernels, and allow them to implement callbacks on the GPU to customize the functionality of third-party GPU-callable libraries. The "object linking" capability provides an efficient and familiar process for developing large GPU applications by enabling developers to compile multiple CUDA source files into separate object files, and link them into larger applications and libraries. GPUDirect technology enables direct communication between GPUs and other PCI-E devices, and supports direct memory access between network interface cards and the GPU. It also significantly reduces MPISendRecv latency between GPU nodes in a cluster and improves overall application performance. NVIDIA Nsight Eclipse Edition enables programmers to develop, debug and profile GPU applications within the familiar Eclipse-based IDE on Linux and Mac OS X platforms. An integrated CUDA editor and CUDA samples speed the generation of CUDA code, and automatic code refactoring enables easy porting of CPU loops to CUDA kernels. An integrated expert analysis system provides automated performance analysis and step-by-step guidance to fix performance bottlenecks in the code, while syntax highlighting makes it easy to differentiate GPU code from CPU code.